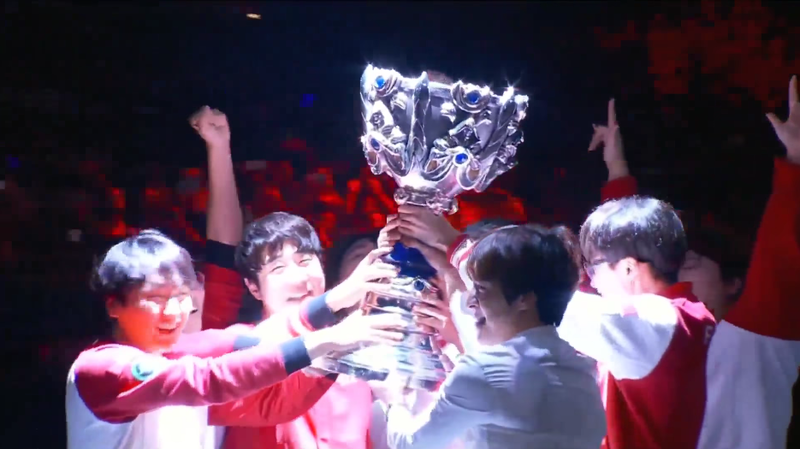 SK Telecom T1 lift the Summoner's Cup after winning Worlds 2016. Samsung Galaxy fought great, but SK Telecom T1 was hands-down the better fighter. And after adding a third championship to their name in just four years, it's safe to say they are the best team in League of Legends history. That outcome seemed just as inevitable before last night's finals as after them. Of course SKT would take the series. Of course Lee "Faker" Sanghyeok was going to win MVP of the tournament and solidify his legacy as the best player in League of Legends history. 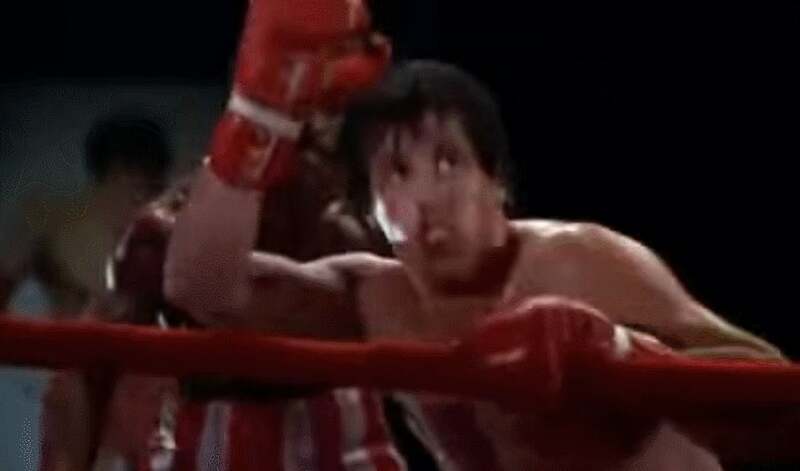 Apollo Creed was always going to beat Rocky senseless, winning on points if nothing else, making you feel silly for ever truly doubting the outcome. SKT did something similar last night, even going so far as to troll any part of the Staples Center audience who had momentarily believed that SSG might somehow accomplish the unthinkable. "Thanks for cheering us," Faker said to the crowd at the end of the night, "but don't cheer us too loud, because we're going to be back here anyway." But for a couple hours last night, SSG did make people believe. 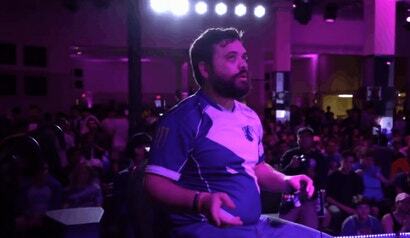 They clawed their way back from a seemingly hopeless game three, eventually tying the series at 2-2. Even though SKT convincingly beat them in the second half of the fifth and final match, SSG proved their superior rivals would have to play at the top of their game to do so. SSG chases SKT into the river desperate to create something. The fight was a mess, with SSG narrowly taking out one of SKT's weaker supports, before later trading the kill right back after Faker swooped in to steady his team. It was desperate but it was something, suggesting that with their backs up against the wall, SSG would at least try to give back some of the punishment they'd received before exiting the world stage. Then, only a few minutes later, when SKT probably expected SSG to be licking their wounds and preparing for the end, the former champions let their guard down and tried to hastily take Baron with several players still out of position. 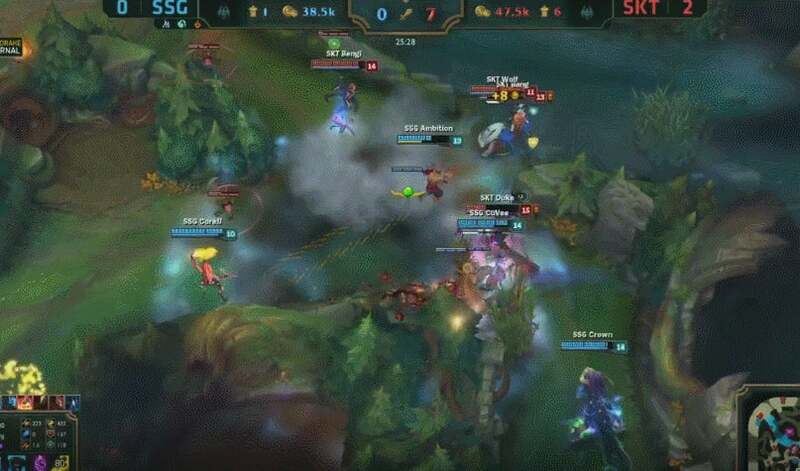 As if SSG could smell in the air that it was do or die for them, they marched up to the pit and pounced on their opponents with everything they had left. 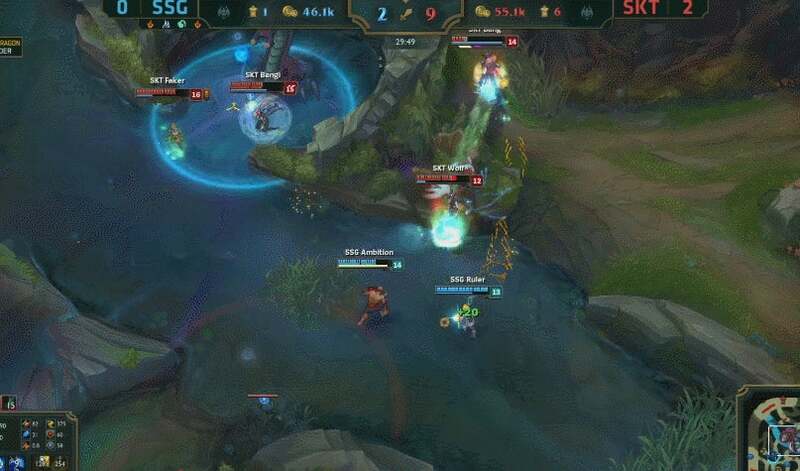 The move proved a pivotal turning point in the match, cutting STK's lead more or less in half and securing SSG the Baron buff. SSG divides and conquers SKT with a little help from Baron. From there, both teams fought bitterly for another 40 minutes. Moments earlier, the casters and analysts had all but declared the match complete and the series won, but SSG had other ideas. Rather then resign themselves to defeat, SSG decided to make SKT pay dearly for taking an early victory lap. In some ways, this is what makes SSG's almost-comeback more admirable and compelling than the close 3-2 semifinals that almost saw SKT defeated. SSG made the finals competitive and long-lived not because of relative parity between the two teams facing off but in spite of the lack of it. They kept up with the best of the best, held their own, and found a way to exceed their limits when nobody expected them to get back off the mat. Rocky scrambles against the ropes after swallowing too many blood capsules. The best parts of any competition are the moments that make everything feel equal, when you are momentarily convinced that all possibilities are open and we don't actually live in some cold, deterministic universe. 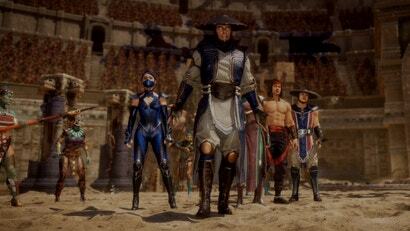 SSG helped create that illusion not just for one match, but across several. Of course, every competition needs a winner, so eventually the dream always ends. To the degree that any team can ever "deserve" to win, SKT fulfilled those criteria last night, and the fact that they now have as many Worlds championships as every other team in League of Legends combined means they're achievement won't be forgotten any time soon. But if there's any reason to remember this particular championship series years from now, it will be because of SSG's stunning game three rally.